Last week my sister and her girlfriend, Kara, came to visit. My parents gave her their old car, so they are now driving back to San Diego. We only get to see her about once or twice a year, so it was nice she could be here. 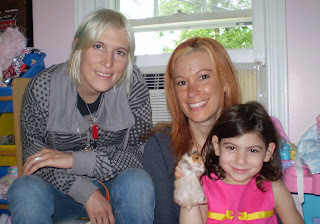 Genevieve was thrilled to have someone new to show off her hamster to. Genevieve told Jessica that it was too bad she was unlucky and had never found a man. Fortunately Jessica thought it was funny.